Today I am opening up something fun that will become a series about THE EMPOWERED WOMAN. Who is she? What does she look like? Let’s begin with a definition from the Oxford Dictionaries. I was so struck when I read this message. Particularly the last sentence which places all the power in our own hands and requiring, as all true miracles do, simply a shift in our perception. Same body, same person, same problems - different experience. I could be strong, simply by seeing myself in the most favourable light I could imagine?! I felt like I had again discovered “the secret” that I continually find myself learning, forgetting & rediscovering over and over again. Life becomes a different experience, simply in the way we perceive it! And with that I hope it lands that everything I write from here on is available to you, simply with a shift in perception. So, what does empowerment mean to me? Empowerment means living & embracing the full extent of our power. Finding our inner strength to live & consciously create the life & experiences we desire. To show up fully & authentically as ourselves. The Empowered Woman lives as a full expression of her truth. She embraces all aspects of herself. She takes responsibility for her life. She is confident in herself, she knows her power. She sets boundaries that support her. She speaks her mind & embodies her truth. She uses her voice as inspired & expresses herself fully. She prioritises her health & fulfilment above all else. She embodies love, facing fear head on with courage. She decides, she knows her strength. She feels her feelings fully, listening to the wisdom they provide her. She communicates consciously and confidently. She expresses herself emotionally, spiritually, sexually, physically. She partners with people who respect her, who uplift her, who value her and she them. She does not fear time or age. She is connected to herself & trusts the inner wisdom she receives. She knows what she wants and she creates it. She honours her body & her cyclical nature. She believes in her equality. She is love, kindness & compassion. She is grounded & flowing. She belongs, because she accepts herself completely. She is centred, in alignment with her higher self. She recognises her limitations & ensures she is supported as she needs. She asks & receives without guilt. She loves without reservation, without games, without scarcity. She sees her beauty inside and out. She is connected to her body, her heart & understands her mind. She gives without diminution of her power. She draws from her masculine & feminine energy as she needs. She does what she loves. She follows her passions, her curiosities, her inspirations. She takes them seriously. She stands up for what she believes. She supports, empowers & inspires others. She is a conscious creator. She knows who she is, what she needs & she moves through life in that power. The power of knowing who she is. She is not a victor because she holds no prisoners. And she certainly is not a victim because she is not imprisoned. The Empowered Woman represents freedom. Take a moment to breath that in. To taste it, to feel it - The Empowered Woman is FREE to be herself. Isn’t that what we are searching for? Freedom to live the life we want to live. Freedom to feel the way we feel. Freedom to express ourselves fully. Freedom to show up completely as ourselves and to be accepted. Remember the shift in perception. This freedom is available to you at any given moment - all it takes is a conscious shift in your perception. I’m a prisoner or I’m free. The Empowered Woman lies in every single one of us. How would it feel to embody this part of yourself? How would you life look? What would you change? I like to see my inner Empowered Woman as a part of myself that I can call on & align with at any time. What would my inner Empowered Woman do? And now I would love for you to explore your own definition of The Empowered Woman. Who is she and what does she embody for you? Share with us in the comments below! Let’s draw a picture together! Stay up to date with The Empowered Woman Series and all my latest content & offerings by subscribing for my newsletter below. Are you ready to embody your Empowered Woman? 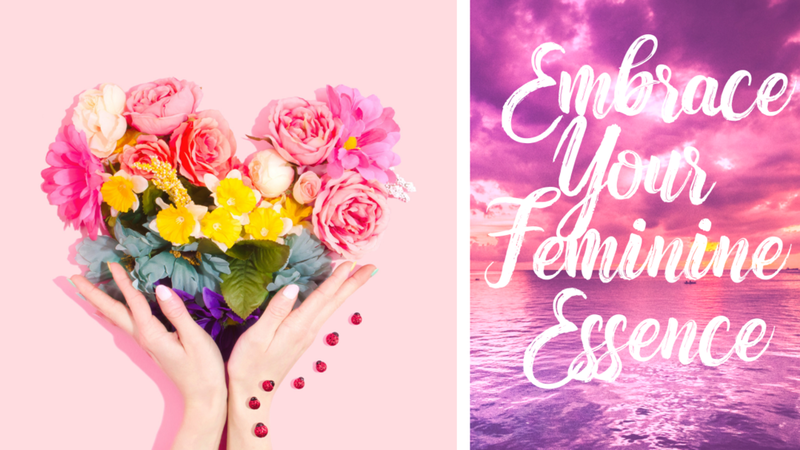 I invite you to check out my signature online program, Embrace Your Feminine Essence: this is my online course to Embrace Your Feminine Power & Live As the Empowered Woman You Truly Are. Check out this page to find out what we cover. Want to go even deeper? I’m also excited to be offering 6 month 1-1 coaching packages - 6 months of 1-1 coaching to help you step into your power & show up for the life you truly desire - you can find all the details here.